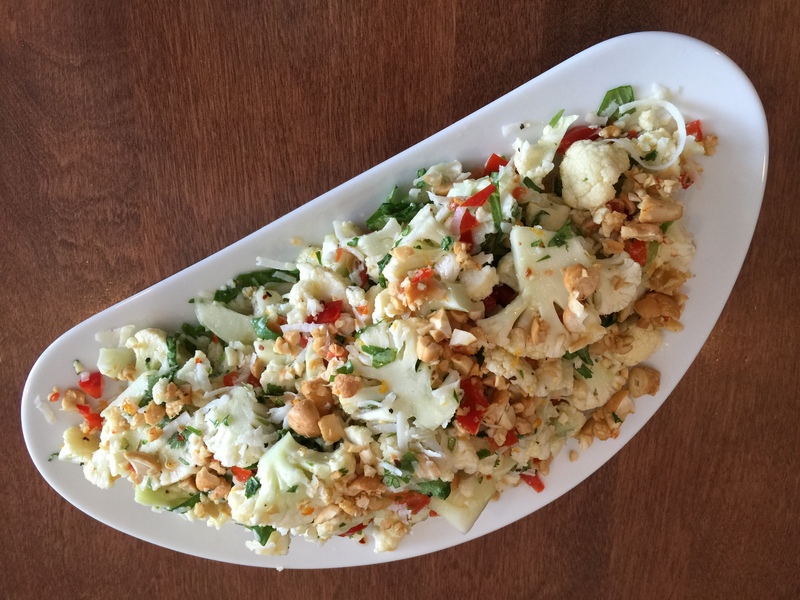 Raw Cauliflower Salad: A MUST TRY! Almost any restaurant you walk into these days will feature a signature Cauliflower Salad. Thank goodness it’s one of the top trends this year because it’s a great diet dish that’s really healthy for you. As an aside, if you’re on a low carb diet and you steam cauliflower and puree it, it will help you not miss your potatoes. In fact, many people won’t even be able to tell the difference. Often when I serve it to guests they remark, “Wow. These potatoes are really good!” Cauliflower also contains a lot of fiber, which should help you feel full longer as well as being healthy for your heart. Cauliflower has antioxidant properties (Vitamins C and E, folic acid, lycopene, alpha-carotene and beta-carotene). It also contains nutrients that protect you from the sun and help you to age well. It’s possible to find conflicting information on whether nutrients are destroyed by cooking, but certainly some of the less stable ones are lost. So why not eat it raw? If you slice the florets very thinly, you won’t notice so much that it’s not cooked. Mixing in other things will also help to develop an interesting taste. Here’s a recipe that I like. It pairs well with anything – meats, poultry, pork, or fish. It’s just a little spicy but you can make it more so by adding more Peppadew pickled peppers (usually found in the deli section of your grocery store). For interest, you can use other colors of cauliflower (yellow or purple) or mix up the colors. The purple variety has even an extra antioxidant, the same one found in red wine. Layer the first seven ingredients in a bowl. Mix together the oil, vinegar, garlic, zest and juice. Pour it over the ingredients. Mix by folding with your hands, trying not to break up the cauliflower too much and that’s it. Couldn’t be simpler! Can be made several hours ahead of your meal.